Thermoelectric devices developed by MIT turn waste heat into electricity for vehicles and other machines; a holey graphene framework developed by UCLA researchers bridges the gap between traditional capacitors and batteries to put them on par with lead acid batteries. According to MIT, it is estimated that more than half of U.S. energy — from vehicles and heavy equipment, for instance — is wasted as heat, which mostly escapes into the air. However, an MIT professor and his team have begun to change that with thermoelectric materials that convert temperature differences into electric voltage.About a decade ago, Gang Chen, the Carl Richard Soderberg Professor of Power Engineering and head of MIT’s Department of Mechanical Engineering, used nanotechnology to restructure and dramatically boost the efficiency of one such material, paving the way for more cost-effective thermoelectric devices. Using this method, GMZ Energy, a company co-founded by Chen and collaborator Zhifeng Ren of the University of Houston, has now created a thermoelectric generator (TEG) — a one-square-inch, quarter-inch-thick module — that turns waste heat emitted by vehicles into electricity to lend those vehicles added power. This image shows the inside of GMZ Energy’s TEG module. 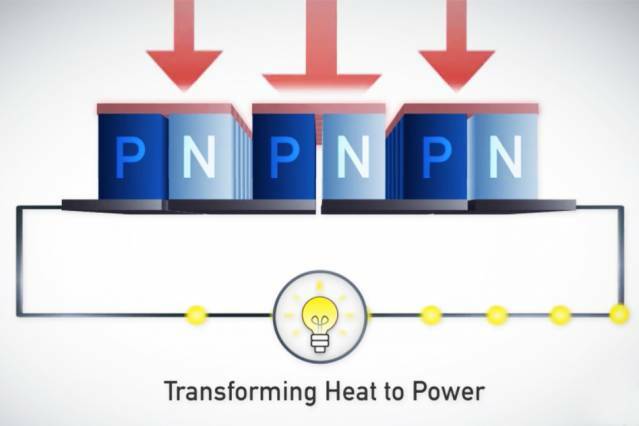 When waste heat enters the top of the module, and moves through the semiconductor material (shown here as P and N) to the cooler side, the resulting temperature difference creates a voltage that’s extracted as electricity. In a TEG, electricity is generated when heat enters the top of the module, and then moves through the semiconductor material — packed into the TEG — to the cooler side. The resulting motion of electrons in the semiconductor under this temperature difference creates a voltage that’s extracted as electricity. A special graphene material has been used by researchers at the California NanoSystems Institute (CNSI) at UCLA to significantly boost the energy density of electrochemical capacitors, putting them on a par with lead acid batteries — and set the stage for what they are calling a watershed in mobile energy storage. The material, called a holey graphene framework, has a 3D perforated structure characterized by tiny holes, which not only increases energy density but allows electrochemical capacitors to maintain their high power density. However, ECs have had energy density of at least one order of magnitude below batteries. The main component of an EC is its electrode material, which is responsible for the EC’s overall performance, so recent research has focused on efficient new materials that are able to increase energy density without sacrificing power density or cycle life. A high-performance EC electrode must have high electrical conductivity, a high ion-accessible surface area, a high ionic transport rate and high electrochemical stability. Current state-of-the-art ECs generally use porous activated carbon electrodes with energy densities much lower than lead acid batteries — 4 to 5 watt hours per kilogram vs. 25 to 35 watt hours per kilogram (5 to 7 watt hours per liter vs. 50 to 90 watt hours per liter). 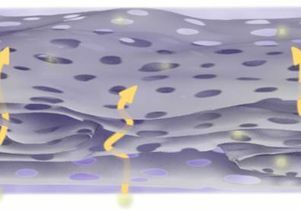 Close-up view of holey graphene framework film; arrows highlight ion-transport pathway short-cuts. The holey grahene EC bridges the energy density gap between traditional capacitors and batteries, yet with vastly higher power density, and creates exciting opportunities for mobile power supplies for many applications from cell phones to electric vehicles, the researchers added.